My husband Geoff and I were looking for somewhere near to our hotel in Southwark, London to eat at on a Friday evening, the day before our wedding anniversary. What I should have done was looked at Helen’s blog post of where to eat in London. How stupid of me, it had places for brunch too which I could have done with for the following day. 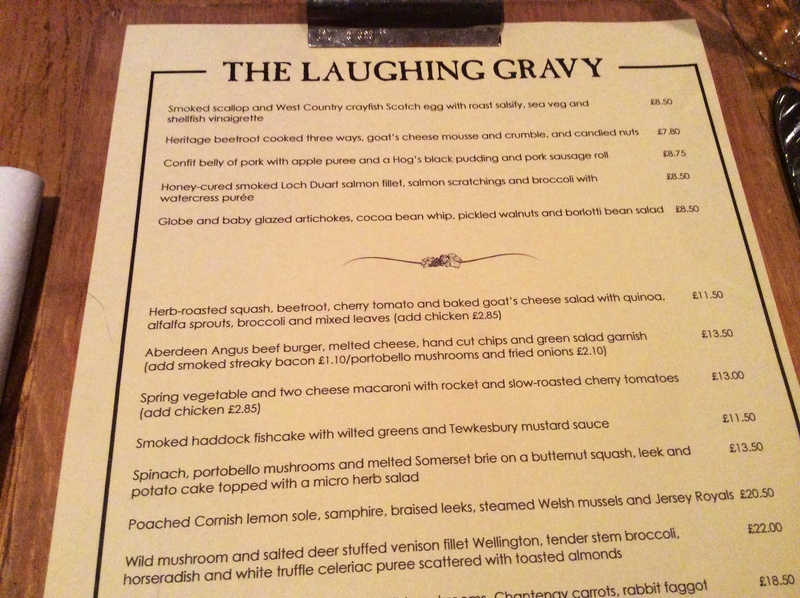 However, we were lucky to find The Laughing Gravy on TripAdvisor and as it was just around the corner from our hotel, it was ideal. Geoff and I were in London for the weekend as I was taking part in the Prudential Ride London – Surrey 100 cycle ride. We both did this event last year in excellent weather. This year was totally different, the rain was biblical! But, I enjoyed it immensely, even though I had two punctures along the way. Back to the review – oops. Well, firstly I’d like to apologise for the photos in the post. I didn’t take my camera to London so had to rely on the iPad, which doesn’t seem to take good photos in dim lighting. So, with excuses out of the way I shall get on with this review. We’d pre-booked The Laughing Gravy to make sure we got a table. Arriving earlier in London than expected we thought we’d pop along to see if we could get in earlier than our booking, if not then we would sit and have a drink at the bar. As it was, they said it was fine but they just needed to get our table ready. 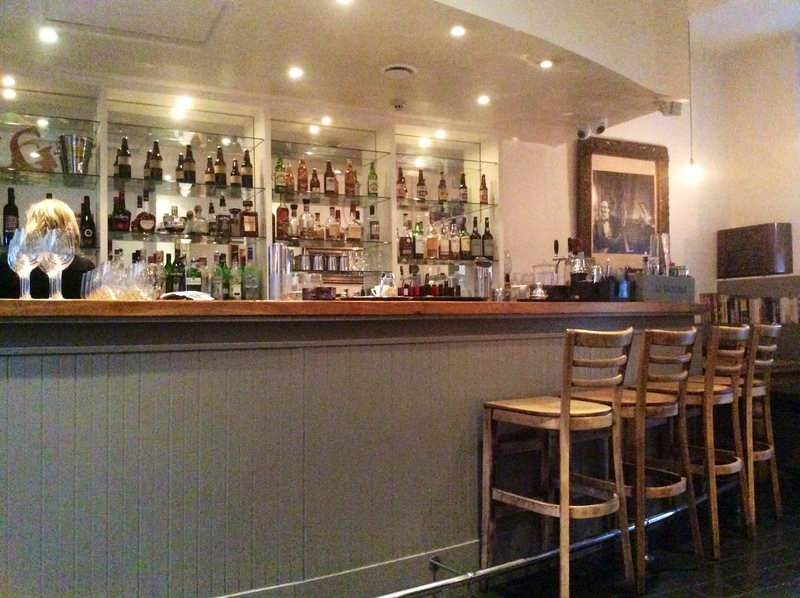 We sat on the comfy leather seats in the bar area and perused the drinks menu. 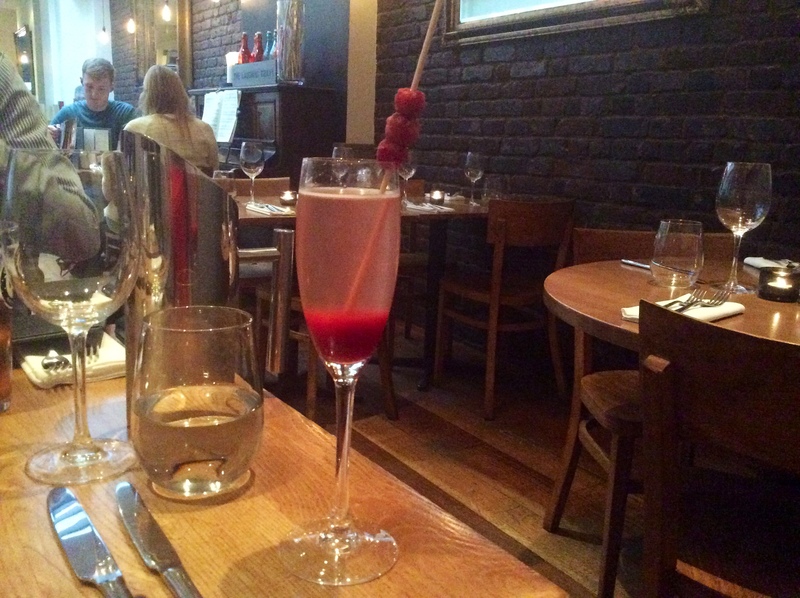 As soon as I walked in I’d clocked the blackboard saying there was raspberry bellini. I chose this. In the bar area there are also a few reading books which is rather a good idea, especially if you’re waiting for someone or drinking alone. We were shown to our table by a friendly young waitress. 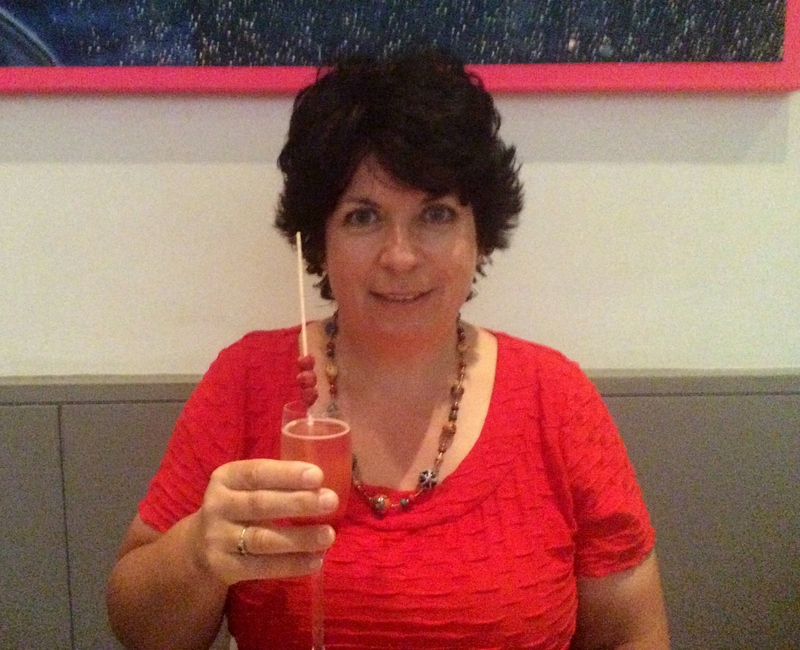 My raspberry bellini was delicious. Geoff had a pint of Camden Town pale ale and proceeded to tell me the history of IPA (pale ale), which I won’t bother boring you poor souls with. 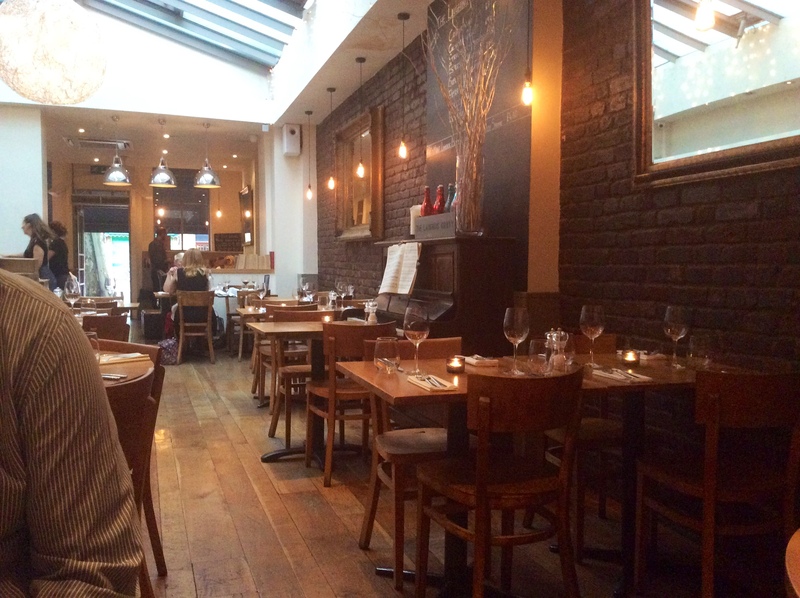 We also ordered a carafe of 2010 TerraGens Sangiovese di Romagna Riserva from Italy – served at room temperature – which smelt wonderfully oaky and blackcurranty, bold and very smooth. It was superb. In the background I could hear at first what sounded like plinky-plonky/big band music then realised it was Jamie Cullum. On the walls were rather surreal paintings and some old maps of the world. In the ceiling was a large sky light and a very large light hanging down which was nice. 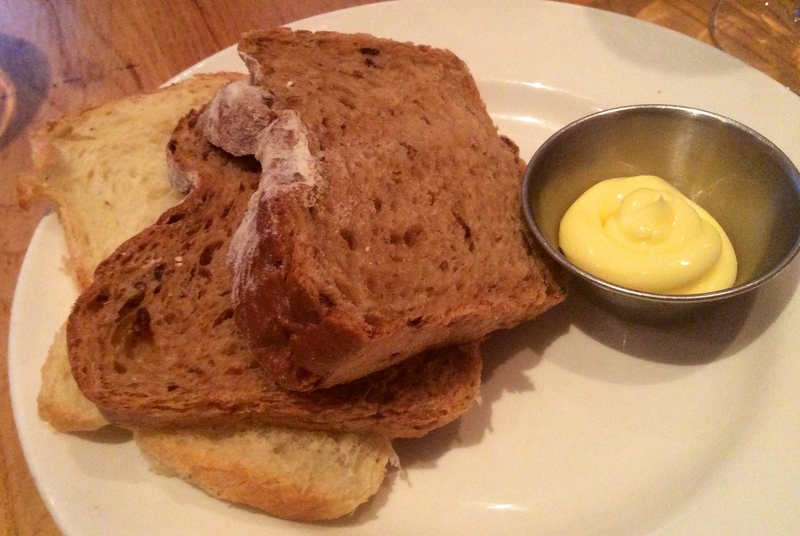 We were offered some bread which was very fresh indeed, with spreadable butter. 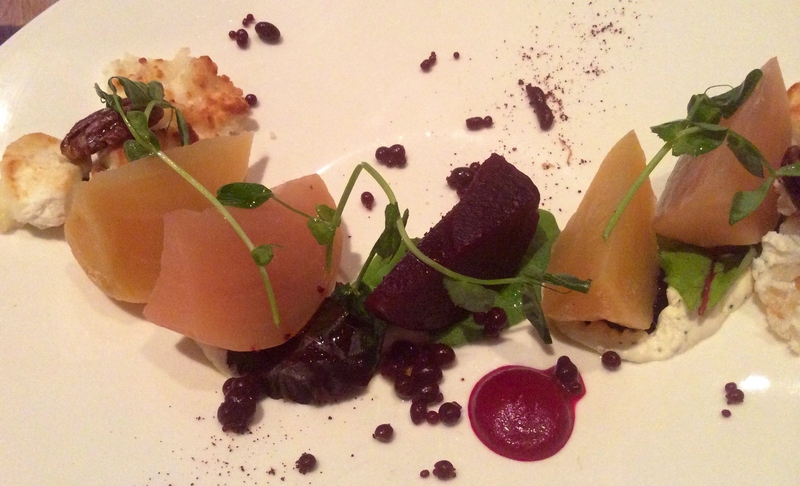 My starter was the Heritage beetroots cooked three ways, goat’s cheese mousse and crumble and candied nuts. I quite like beetroot but mainly chose this dish because it was something a little unusual. There was pickled beetroot, roast and cooked. It was quite tasty and there were tiny berries – juniper berries, I wondered? However, they may have been too small for it to have be them. The candied pecan nuts were lovely. Geoff’s decision was the best though. He gave me a little to try. 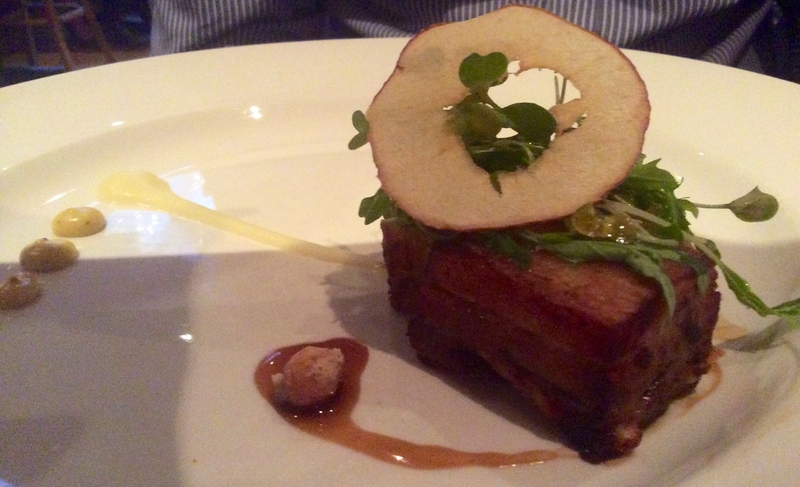 It was my favourite, confit belly of pork, with apple purée, black pudding and pork sausage roll. Both dishes were very nicely presented. 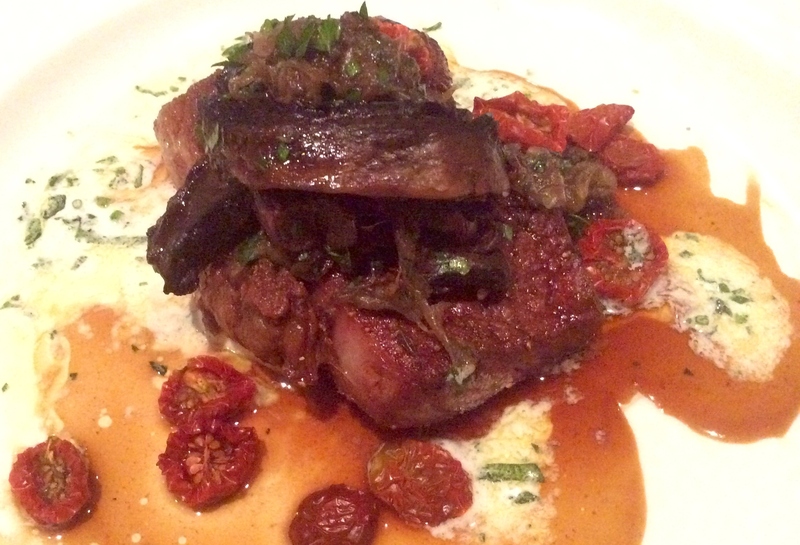 For my main dish I chose the sirloin steak, shallots, mushrooms, slow roasted cherry tomatoes, Madeira sauce and garlic butter. The beef was nice and tender and only a little fat around one edge, which is quite natural on a sirloin steak, of course. 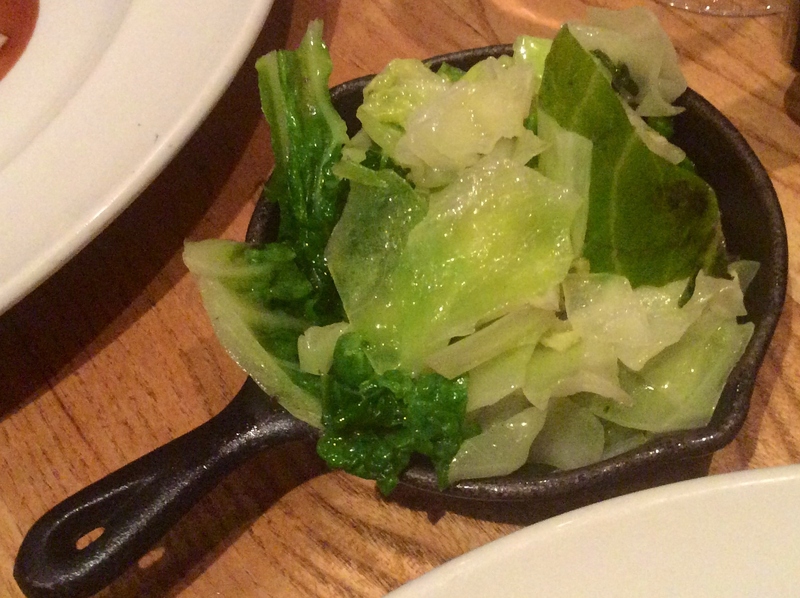 We could probably have done with two of these mini skillets of seasonal greens, but we also had a side order of chips to share which were nice but I forgot to take a photo, but you know what chips look like don’t you? These were in a little bucket if I remember rightly. 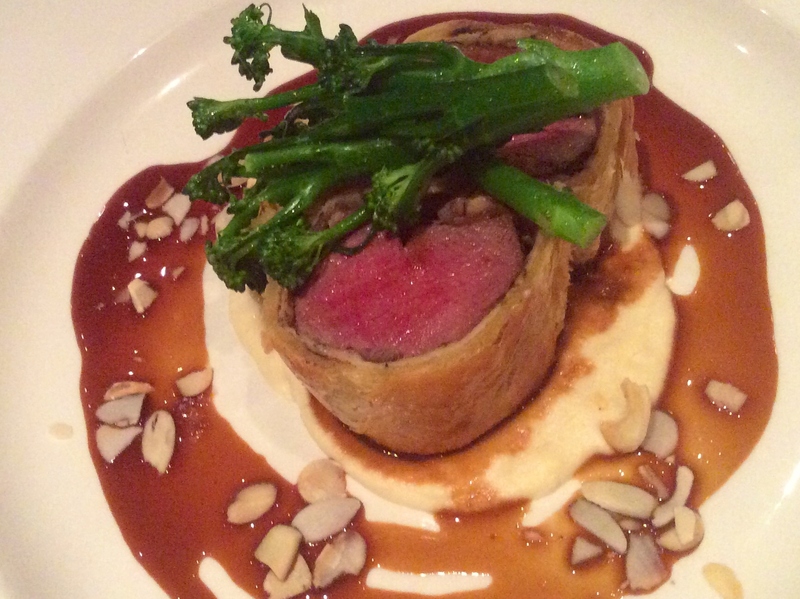 Geoff’s main dish was Wild mushroom and salted deer stuffed venison fillet Wellington, tender stem broccoli, horseradish and white truffle celariac purée, scattered with toasted almonds. I’ve only had venison once before so wasn’t sure I’d like it as it was a while ago. We were going to share both of our main dishes but I wasn’t too keen on the meat. It was very smooth and tender though, I just wasn’t keen on the taste. With Wellingtons there’s always a taste of liver – which strangely enough I do like, just not in a Wellington dish). Geoff enjoyed it though so that was the main thing. I asked Geoff what he thought of his meal and he replied ‘the clean plate says it all’. Now this is where the photo’s get worse. By now of course, most of the natural light coming in through the skylight had gone as the evening wore on. It’s a shame as you can’t see just how good my dessert was. I’ll have to explain it for you. 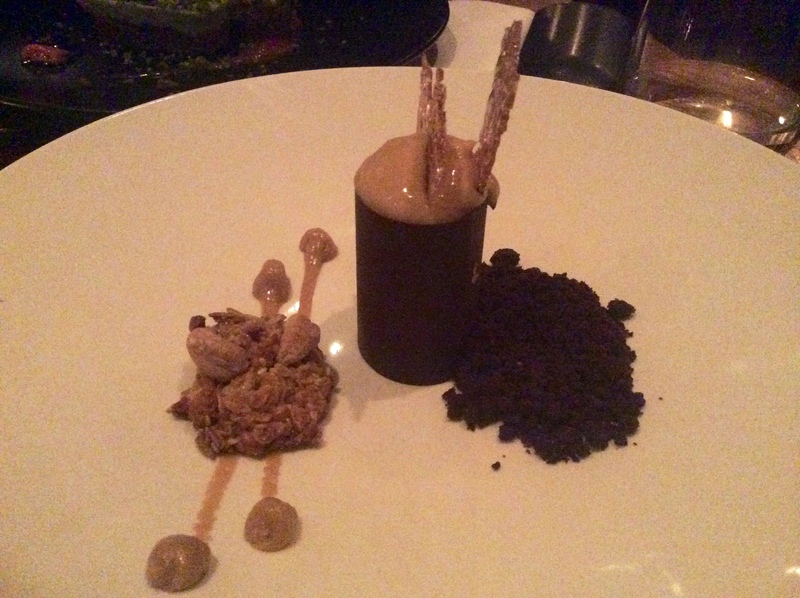 This was Salted caramel fudge and shortbread filled chocolate cylinder with a cashew nut cluster and peanut emulsion. On the left is a small cluster of what was a little like a soft flapjack with a few cashews. The little blobs in front of it were the peanut emulsion. Tasting of smooth peanut butter, but less thick. At the side of the cylinder was, hmm I’m not sure, it was dark chocolate biscuity bits – similar to chocolate ‘soil’. Very nice though. And the best bit was of course the chocolate cylinder and what was inside it! The salted caramel fudge may have been too much for some, but not me. It was very sweet, very thick, very gooey and very rich and it went all the way down to the bottom of the cylinder. In amongst it were chunks of the shortbread presumably, although it was a bit like meringue. The cylinder itself was dark chocolate and melted in the mouth. Stuck in the top were two shards of burnt sugar/toffee. After all that I had an espresso coffee which was Monmouth coffee. I found the coffee too bitter for my taste and it left me pulling that funny face whenever I have a drop of whisky or brandy. No petit fours served with the coffee though, which is one little touch I do happen to like. Even one chocolate would have been nice. Yes, even after that rich chocolatey dessert I’d just had. The interior with Geoff not quite ducking far enough out of the shot. I told Helen where we were eating and she had been there at Christmas time with work colleagues. I’ve just found the photo of her there with her Christmas jumper on. Of all the restaurants, we unknowingly choose one where our daughter went to 8 months previous. Geoff and I both enjoyed our meal at The Laughing Gravy. Well worth a visit if you’re in the area. 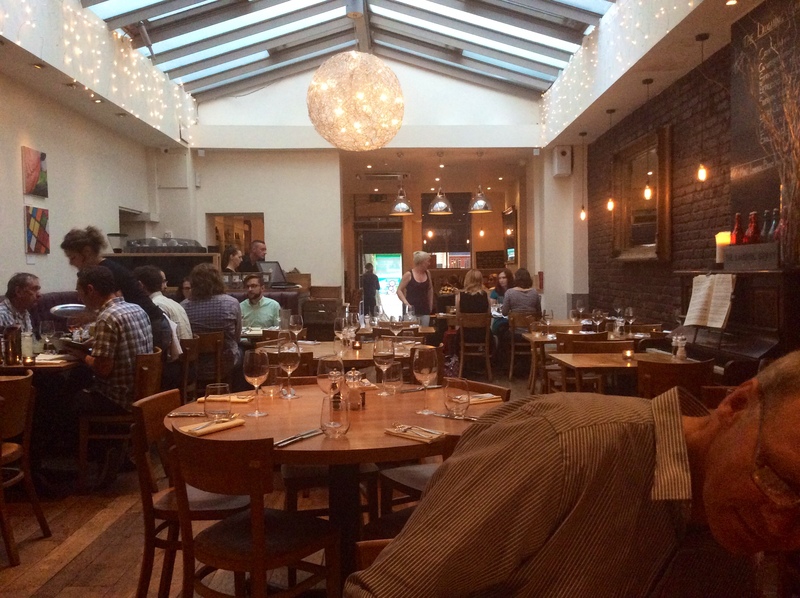 The service was good, polite and friendly, the food was good, the atmosphere was good too. What more could one want?